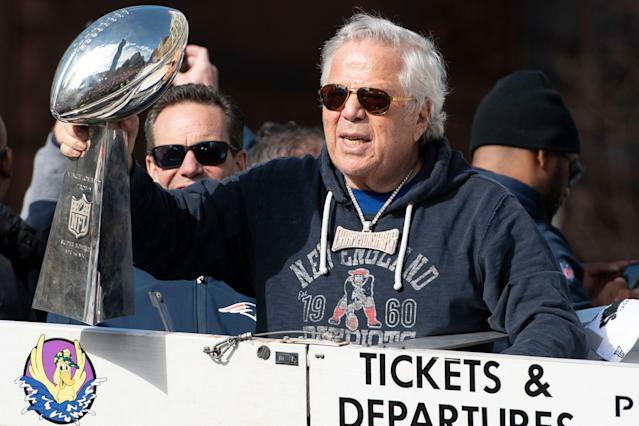 Robert Kraft has a court date — March 28, 2019, at 9 a.m. ET — for an arraignment hearing stemming from two January visits to a Florida massage parlor. And for this, Kraft, according to court records, must attend, which, if the case is not settled before then, is sure to set off a paparazzi frenzy outside the courthouse in Palm Beach Gardens, Florida. The date at the Palm Beach County Circuit Criminal Court comes one day after the NFL owners meetings wrap up in Phoenix. The New England Patriots owner has pleaded not guilty to two misdemeanor charges of solicitation of prostitution. Prosecutors allege he visited the Orchards of Asia massage parlor in Jupiter, Florida, on Jan. 19 and Jan. 20. Kraft later flew to Kansas City, Missouri, to watch the Patriots win the AFC championship and advance to the Super Bowl, which they won two weeks later in Atlanta. The prospect of Kraft, one of the most high-profile owners in the NFL, walking into court amid a sea of cameras is not ideal for the NFL, which exposes itself as image conscious. Kraft has thus far maintained a low public profile, other than denying he did anything illegal in a prepared statement. Kraft may still be able to resolve the case before the arraignment date. Many legal experts have theorized he’d never have to appear in person in court, thus avoiding the public spectacle. The two first-degree misdemeanors carry charges with a maximum sentence of one year in jail, a $1,000 fine and 100 hours of community service. Additionally, Kraft could be subject to sanctions from the NFL for violating the league’s code of conduct that applies to nearly anyone associated with the league, including owners. That could result in a multi-game suspension and fine. “The NFL is aware of the ongoing law enforcement matter and will continue to monitor developments,” the league said in a statement last month.